Pianist and composer Mike LeDonne was born in Bridgeport, CT, in 1956. LeDonne was practically raised at his parents’ music store and by the age of ten, his father, a jazz guitarist, was hiring him out on gigs. After graduating from the New England Conservatory of Music in Boston, LeDonne moved to New York, where he started working at Jimmy Ryan’s (at the time, one of New York’s oldest jazz clubs). Here LeDonne met and played with some of the great historical figures of jazz, including Roy Eldridge, Papa Jo Jones, and Vic Dickenson, among others. In 1988, LeDonne joined the Milt Jackson Quartet, frequently writing compositions for the group. Jackson eventually recorded several of these compositions and LeDonne became the band’s musical director after Jackson’s death in 1999. 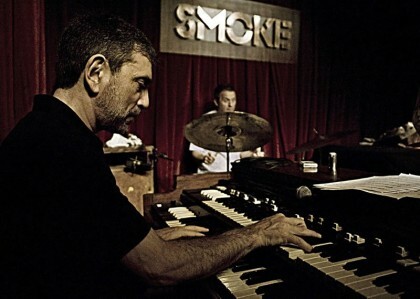 LeDonne began recording in 1988, debuting with the post-bop album Bout Time, which was released on the Criss Cross label. LeDonne recorded several more albums for Criss Cross throughout the early and mid-’90s, peaking with the sextet album Soulmates, a straight-ahead recording which featured soloists such as alto saxophonist Jon Gordon, tenor saxophonist Joshua Redman, and trumpeter Ryan Kysor. LeDonne switched to the Double Time label in 1998, recording Waltz for an Urbanite and, most recently, the quintet album Then and Now, which features the exceptional playing of tenor saxophonist Eric Alexander.